Mighty Max micro playsets were some of the most popular toys of the early-to-mid 1990s, which of course resulted in plenty of rip-offs. One of the coolest releases that took advantage of the Mighty Max concept was a small line from 1996 titled Mysteries of the Universe, which consisted of three different compact UFOs that fit in the palm of your hand and contained micro visitors from outer space. These were manufactured by Uni-King Toys of China, and I believe distributed mainly to discount stores. That's where I remember getting mine--probably for a couple bucks. There's a black ship, a green ship and a blue ship, each with a different design and each including different micro aliens and other accessories. To add to the coolness, all of the sets include items found on Earth that have been associated with extraterrestrials, such as pyramids, a Moai, a Dogū, and Nazca Lines. 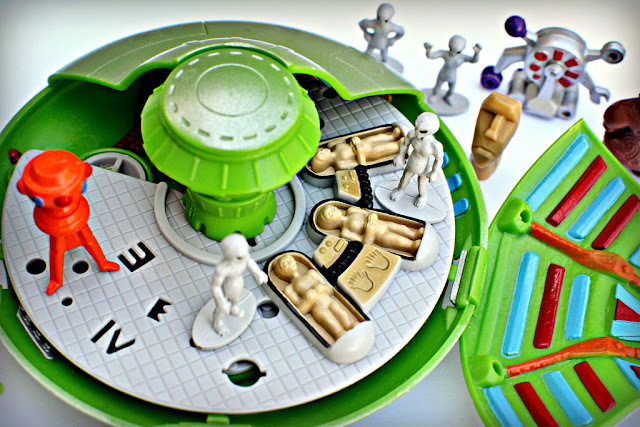 I own only the shiny green UFO, which comes with the classic alien greys, plus the awesome little Moai and Dogū statues,and a couple machine-type accessories. All four aliens have a different sculpt, which is a nice touch. When you open up the ship, you see a few more aliens lying in pods, either sleeping or being experimented upon. So cool! Considering these were dollar store types of toys, the fun factor and level of detail are fantastic. Whoever designed them clearly put a good amount of research, thought and effort into them. I like the one I own so much that I've been tempted to track down the others. You can find a detailed review of one of the additional two UFOs over at Dinosaur Dracula. Who else has any of these or remembers them? I've been looking to I D mine for an age...brilliant post and much needed! I want one of these so badly. They're incredible, especially the Dogu! I know -- that and the little Moai are probably my favorite pieces! SWEET MERCY! I NEED these! I am a HUGE micro sets fan, how did i not know of these!? Great review, thank you! I will for sure be hunting for these! Yeah man! Very obscure, but very cool. Happy hunting. Love these guys and the 'micro' toy concept. Just got two out of the three very recently. Need the blue UFO, I like how they look like the Hopkinsville aliens. They pop up on ebay once in awhile, usually around the $20 mark. I have an extra green ufo boxed, but was unable to get a bid at $12. I was recently able to get the two I needed to complete a set of three! The green one is still my favorite (I think it has the coolest inside and figures), but all of them are great. Good luck finding a blue one for your set! I own the black one and the green one. Both are in Ex Cond. Would sell for the right price. 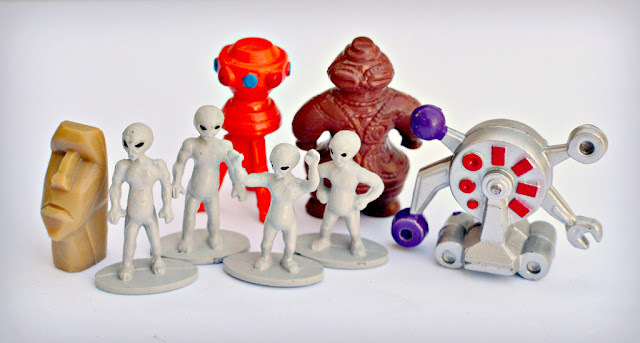 I saw your post on Little Weirdos site and I am selling the blue and black UFO sets on EBAY right now (2/22/18). They are both currently bid on at $20.00 each. Just to let you know, Larry.